The human brain is a wondrous, quirky, and unpredictable meaty machine. Most of the time, it acts on its own, free of conscious constraints, linking sparks of thought that randomly wander through its synapses like drunkards in a labyrinth of narrow alleys. 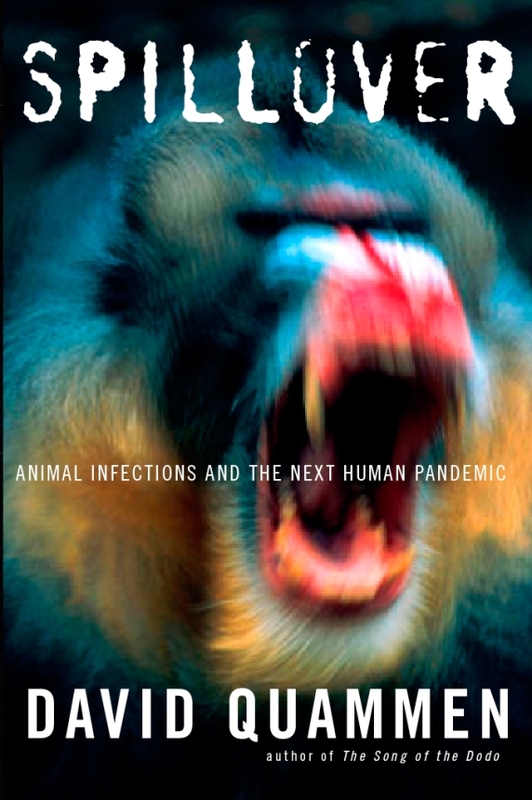 Last night, while reading Spillover: Animal Infections and the Next Human Pandemic, by David Quammen, I had one of those fleeting moments of accidental insight. Nothing particularly profound, but still useful, I guess. Spillover is an inspiring piece of storytelling, carefully structured and very well written (1). Maybe that's why it made me think about several things related to my own book. First, the reviews by Nathan Yau and Nick Diakopoulos, which highlight that its main focus is graphics storytelling, not data visualization per se, although there's plenty of that as well, as Robert Kosara has gently written. Second, the interviews with John Grimwade (download it) and Moritz Stefaner (read a small portion), which offer opposing views of the role of storytelling in our field. The contrast between John's and Moritz's approaches is revealing. John is a designer and a journalist, and that shows: "Our main goal should be to tell a story clearly by achieving order and having some sort of narrative through each graphic." Moritz contends: "The most fascinating thing about the rise of data visualization is exactly that anyone can explore all those large data sets without anyone telling us what the key insight is." John thinks as a storyteller; Moritz sees himself as a facilitator, someone who designs tools that citizens can use to build narratives on their own. Some scholars identify the boundary between "infographics" and "data visualization" in this presentation-exploration gap but, as I wrote in the introduction, I think that the wall is much more porous than it seems. I am hardly the first one to point this out: Edward Segel and Jeffrey Heer, both in the data visualization side, wrote a great paper about the value of narrative visualization a while ago. I am a journalist, so I am slightly biased toward John's approach. But I also sympathize with Moritz's idea of providing full access to data. In my own work, and also in The Functional Art, I have tried to reconcile both philosophies by explaining that you can have summary and depth if you layer data correctly, if you structure presentations in ways that readers don't feel overwhelmed by too much complexity at a first glance. We can all learn from Hans Rosling's style, I believe: get audiences interested first, using traditional storytelling techniques (2); then, give them access to the interactive, multivariate, build-your-own-meanings part. Never forget to add what Amanda Cox calls the annotation layer, "the careful use of labels, introductions, explanatory text and captions", in the words of Andy Kirk. All this implies that anyone in infographics and visualization should not work just as a visual designer, the kind who thinks just about layout, type, color, interface, and the latest trendy programming language, but as a true information designer, someone who also cares about words. That's why journalism skills can be very helpful for any designer, and reading good non-fiction regularly is so beneficial. They allow you to avoid the challenges Reg Chua outlines in a recent post. What are those skills? Think about how to write a headline, or a lead, or good copy in general, about how to structure a story made of graphs and maps in a meaningful way, etc. Many good projects out there illustrate the importance of understanding the symbiosis between copy and visuals; see this one, this one, and this one, among many others. You cannot have one without the other. 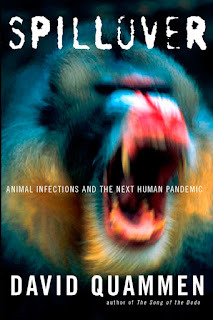 (1) I have added all Quammen's previous non-fiction books to my wish (waiting) list, as if it were not long enough already. (2) We humans love stories. You may think that this is good or bad, but that doesn't change this very basic fact: We usually learn better, and we remember more, when information is presented as a narration. A couple of books about this: On the Origin of Stories, by Brian Boyd, and The Storytelling Animal, by Jonathan Gottshall, which is more recent, but also weaker.